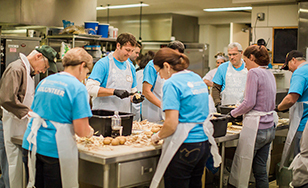 A file photo shows volunteers preparing the Thanksgiving feast. A favorite community tradition is coming up once again, as the 29th annual Twin Ports Thanksgiving Buffet will be from 11 a.m. to 3 p.m. on Thanksgiving Day, Thursday, Nov. 22, at the Duluth Entertainment and Convention Center. More than 5,000 free meals will be served at the DECC's Lake Superior Ballroom, thanks to the efforts of hundreds of community volunteers. The community is invited to enjoy a traditional Thanksgiving meal with all the trimmings, including roasted turkey, potatoes, gravy, and dinner rolls. More than 1,200 meals will be delivered to homebound residents as well. Homebound residents in the Duluth, Superior, Two Harbors and Cloquet areas who would like to request a home delivery meal can call (218) 723-6484. Requests must be received by Friday, Nov. 16. The College of St. Scholastica collaborates with many local organizations on the annual event. The remaining food from the buffet is rescued by Second Harvest Northern Lakes Food Bank. Free transportation to the DECC will be provided by the Duluth Transit Authority (DTA). The DTA's Thanksgiving holiday service, sponsored by National Bank of Commerce, will feature two special shuttles, Turkey Bus 1 and 2, which will transport passengers directly to the DECC from selected sites throughout the Twin Ports. They will operate between the DECC and the Duluth Transportation Center, as well as other sites including the Damiano Center and CHUM. In Superior, the shuttles will operate from the Royalton Manor, 14th and Tower Avenue, Clifford Lund Residence, and Solid Rock Mission. The event will also feature a children's craft corner, books for kids, and a visit from Santa. Monetary donations are welcome to support the Buffet. Please send to: The College of St. Scholastica, attention: Thanksgiving Buffet, 1200 Kenwood Ave., Duluth, MN 55811.